It’s award season right now, and Picture Butte is no stranger to it. 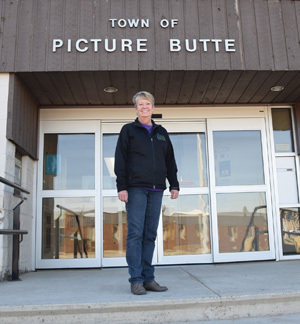 Come this Friday, the Picture Butte Chamber of Commerce will present their own awards, including the Citizen of the Year award, which this year, will go to Wendy Jones. According to her nomination for the award, Jones had “served our Town with compassion and with determination to make improvements to our town”. However, when asked, Jones said she was surprised to learn about her winning the Citizen of the Year nomination, as “to me, I did no more then what you should do”, but she was “shocked and honoured” to win. Some of Jones volunteer experience dates back to 1974, when she was part of a group of women that started the town’s first preschool. At the times, preschool did not fall under the school division, so the group ran it with government funding and attendance fees, hired their own teacher and teacher’s aides, and the high school let them use an unutilized room in the old high school. The preschool eventually got so large it was moved out of the high school and into the old library at the school. In addition to interacting with other children, the kids got some needed preparation for grade 1. The school division would later take over the pre-school in 1980. Another experience was in the early 80s, when the ice arena first opened in town, and she helped run the first figure skating club in town. With 120 kids attending — the most they could handle — there was a lot to do there. Jones was also the only woman amongst a group of otherwise all men who raised money and shaved their heads to purchase a Jaws of Life for the local fire department, in an event at the Picture Butte Hotel in 1996. Jones’ head was shaved first, by the event organizer Morris Zienstra, and helped shave the heads of her fellow volunteers. But ironically, the fire department fundraiser soon needed the help of the fire fighters. According to papers from the Sunny South News archives, a fire broke out at 2 a.m. on June 15, 1996. Everyone in the hotel, approximately 30 people, was able to get out safely. The Picture Butte fire department was able to quickly put out the fire, which was in the north end of the hotel, and returned to the scene later on in the morning to put out flare-ups in the building’s ducting. A fire investigator found the cause to be electrical, and the hotel was closed for repairs. That day’s excitement didn’t deter her from shaving her head later on in the early 2010s, but this time it was for the Cactus Cancer fundraiser, in which she had volunteered in for “quite a few years”. Her first political experience occurred in 2005, when she was successfully able to rally residents of Picture Butte to overturn a controversial council decision after launching a successful petition, which got enough names to take the issue to a plebiscite. Residents voted against the decision there, and it was overturned. She successfully ran for a council position in 2007, serving as a town councillor for two terms before running for the mayor’s seat in 2013, which she won by acclimation after her opponent bowed out of the race. She decided to retire from politics in 2017, handing the mayor’s hat over to council veteran Cathy Moore. “Being mayor, I put in a lot of time,” said Jones. “I always did our holidays and what-have-you in the summer, but I always made sure that everyday, I was at that own office to see what was going on. Jones will receive her award at the Picture Butte Chamber of Commerce AGM. which goes Friday, Jan. 19 at the Picture Butte High School. Jones assured that she just has a small speech planned, and her excitement for the day is helped by 14 family members, including eight grandchildren, who are coming to see her receive the award. She urges people who would to see a change in their community to be active about it, noting it was the only way to make something you want happen. “The only way you can make changes or make progress is to get involved yourself,” said Jones. The Sunny South News was alerted by a reader in regards to some mistakes within the original article, including a mistaken date, which had incorrectly stated the date of a fire at the Picture Butte Hotel as being on June 15, 1995. The correct date is June 15, 1996. The article has since been updated to reflect these changes. The Sunny South News apologizes to our readers for any confusion. At 2:39 p.m. on Wednesday, Jan. 17, the Sunny South News was contacted and informed that another family member would be attending, bring the total from 13 to 14. The article has been updated to reflect that.